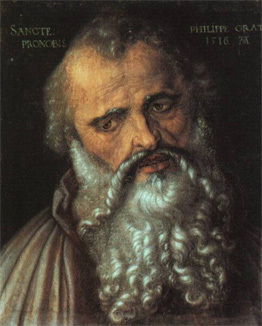 St. Philip was of Bethsaida, in Galilee, and called by our Saviour to follow him the day after St. Peter and St. Andrew. He was at that time a married man, and had several daughters; but his being engaged in the married state hindered him not, as St. Chrysostom observes, from meditating continually on the law and the prophets, which disposed him for the important discovery of the Messias in the person of Jesus Christ, in obedience to whose command he forsook all to follow him, and became thenceforth the inseparable companion of his ministry and labors. Philip had no sooner discovered the Messias, than he was desirous to make his friend Nathanael a sharer in his happiness, saying to him: We have found him of whom Moses in the law and the prophets did write, that is, the Messias; Jesus, the son of Joseph, of Nazareth. Nathanael was not so ready to give his assent to this assertion of his friend, by reason that the supposed Messias was reported to be of Nazareth. Philip therefore desired him to come himself to Jesus and see; not doubting but, upon his personal acquaintance with the Son of God, he would be as much convinced of the truth as he was himself. Nathanael complied, and Jesus, seeing him approach, said, within his hearing: Behold an Israelite indeed, in whom there is no guile. Nathanael asked him, how he came to know him: Jesus repined: Before Philip called thee, when thou wast under the fig-tree, I saw thee. Nathanael, as two holy fathers explain the matter, calling to mind that the closeness of his retirement on that occasion was such, that no human creature could see him, owned him hereupon for the Son of God, and the King of Israel, or, in other words, the Messiah, foretold by Moses and the prophets. The marriage at Cana of Galilee happening three days after, to which Jesus and his disciples were invited, St. Philip was present at it with the rest. The year following, when our Lord formed the college of apostles, Philip was appointed one of that number, and. from the several passages of the gospel, he appears to have been particularly dear to his divine Master. Thus, when Jesus was about to feed five thousand persons, who had followed him into the wilderness, for the greater evidence of the miracle, and for the trial of this apostle’s faith, Jesus proposed to him the difficulty of feeding the multitudes in that desolate place. And a little before our Saviour’s passion, certain Gentiles, desirous to see Christ, made their first address to Philip, and by him and St. Andrew obtained that favor. Our Saviour, in the discourse he made to his disciples immediately after his last supper, having promised them a more clear and perfect knowledge of his heavenly Father than they had had hitherto, St. Philip cried out, with a holy eagerness and impatience: Lord, show us the Father, and it sufficeth us. From which words our Saviour took occasion to inculcate afresh a steady belief of his divinity, and perfect equality with the Father, saying: So long a time have I been with you, (teaching you who I am both by my words and actions,) and have you not known me? (If you beheld me with the eyes of faith such as I really am, in seeing me you would see the Father also, because) I am in the Father, and the Father is in me. After our Lord’s ascension the gospel was to be preached to the whole world by a few persons, who had been eye-witnesses of his miracles, and were enabled, by the power of the Holy Ghost, to confirm their testimony concerning him by doing the like wonderful works themselves. That this might be accomplished, it was necessary that the disciples should quickly disperse themselves into all parts of the world. St. Philip accordingly preached the gospel in the two Phrygias, as Theodoret and Eusebius assure us from undoubted monuments. St. Polycarp, who was only converted in the year 80, enjoyed his conversation for some time, consequently St. Philip must have lived to a very advanced age. It appears, from a passage of Polyerates, quoted by Eusebius, that he was buried at Hierapolis, in Phrygia, which city was indebted to his relies for its preservation by continual miracles, as is averred by the author of the sermon on the twelve apostles, attributed to St. Chrysostom. An arm of St. Philip was brought from Constantinople to Florence, in 1204, whereof we have an authentic history in the Bollandists. The Orientals keep his festival on the 14th of November; the Latins on the 1st of May, with St. James. His body is said to be in the church of SS. Philip and James, in Rome, which was dedicated to God under their name, in 560. The emperor Theodosius, in a vision, received from St. John the Evangelist, and St. Philip, the assurance of victory over the tyrant Eugenius, the morning before the battle, in 394, as Theodoret relates. From St. Philip we must particularly learn an ardent love of God, and desire to see the Father. He asked only this favor, because this was his only desire. Is it ours? Do we feel it so perfect as to extinguish all inordinate earthly affections and desires in our breasts? Do we employ the proper means to attain to this happy disposition? To obtain it, let us employ the succor of this apostle’s prayers, and by disengaging our hearts from corruption and vanity, become, in desires and affections, citizens of heaven. The pilgrim soul sees herself a stranger here on earth, and discovers nothing in this desert place of her banishment hut an abyss of vanity, and subjects of compunction, grief, and fears. On the other side, looking up to God, she contemplates the magnificence and splendor of his kingdom, which will have no end; its peace, security, sanctity without stain, delights without sorrow, unchangeable and incomprehensible joys; and she cries out in a holy transport: “O joy surpassing all joys, and without which there is no true joy, when shall I possess you? O, sovereign good, discover to me some ray of thy beauty and of thy glory; may my heart be set on flame by thy love, and my soul languish and wade with desire to be united to thee, to behold thee face to face, to sing thy praises night and day, to drink of the plenty of thy house, and of the torrent of thy delights, to be forever confirmed in thy love, and in some measure transformed into thee!” Such a soul seeks to hide herself from the eyes of men, to live unknown to the world; and, in retirement and repose, to apply herself to prayer, all her thoughts being taken up in contemplating the glorious things which are said of the blessed city of her God. All worldly enjoyments and distractions are insupportable to her, and she finds no comfort in this place of banishment but in singing the praises of her God, in adoring and in doing always his will, and in the sweet sighs and tears with which she seeks him, and begs him to reign perfectly in her affections by his grace and love, and to draw her speedily to himself out of this Babylon, in which every object increases her affliction, and inflames her desire, seeming to say to her: Where is thy God?